I couldn’t suppress my cravings for home-made pizza so Romeo and I decided to have another round of pizza-perfection; we decided to make two large pizzas this time. Unfortunately, the fact of him having a “booboo” on his left hand (was such a kid while I was treating it, hehe) made him miss all the fun and messy parts. He had to do the cooking and sautéing, though. 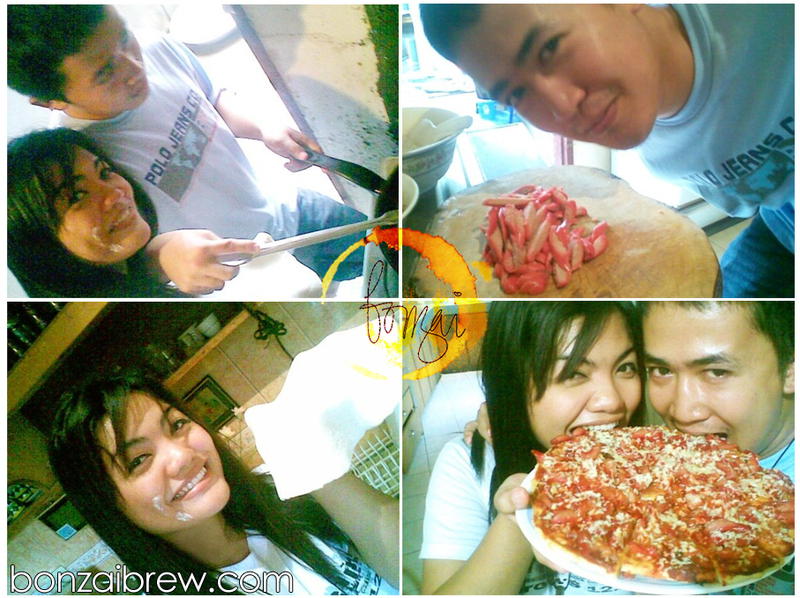 Romeo, saved by his left hand’s temporary disability, had a chance to surf the net and put up random songs just to zest up our eventful pizza-making moments while, I, on the other hand, am having frustrations in crafting perfect dough (making dough is fun, but making two means work). I had my child-like moments in making the dough spin on top of a finger which was one of the things that I so wanted to do when I was just a kid – a rather pointless thing to consider as an accomplishment, but what the heck, it meant blissful “turns”. But it’s nice today; oh the wait was so worth it. All the while, as the songs goes, there was this wonderful silence between us. We listened. He sat from a short distance. He stared and smiled. It was a well-disposed smile in favor of what he was listening to; a feel in his expression that he knows so much of a certain “kind of girl”. I didn’t try to guess what was on his mind; minds of men are hard to read. What mattered at the moment was his stare and grin. And I tried to restrain potential burst of laughs while I was profusely pounding on the dough, but I couldn’t help but laugh and stretch my lips in parallel at its widest. I laughed. I pretended to hub at the dough, but at the sides of my eyes I knew he was nearing. He stood behind me and unpredictably wrapped his arms around my waist as we started to sway with the sweet piece of music. He was “humming” along with the song to my ear, he hummed and I thought of it as his subtle excuse for not really knowing all the words at the moment (hehe), but I knew that the succeeding words from the song are what he’d want to mean. The dough was then already overqualified to my ruling but I so wanted for us to stay that way just a bit longer that I still did frequent dough shaping (hehe) – and I still get that kind of finely-tuned chills like everything’s so new about him despite of us having to love each other for more or less not-so-approximate 17,520 hours. It had me beautifully inspired that I swore I thought I put abstract ingredients in the dough. ♥ – So cheesy. Haha. I was a mess, but he still danced with me. He knows my insecurities no matter how I front with confidence. A complete mess but still he loves me anyway. Knowing this makes me want to do so much and everything for him, and act strong in life no matter how helpless I seem to be which I really am most of the time. But I know my frequent shabbiness is no match for this “Great Love” that I forever have for him. “Mess” was the word of the day. It wasn’t something I would consider a coincidence since I don’t even remember myself having to believe in any, with the fact that I know that everything happens for a reason. In fact, there’s a beautiful blueprint here: I was a mess, literally I knew I was at the moment; and figuratively he knows I am, and he still embraces the worst in me – and it’s the very reason that brings out the best in me.